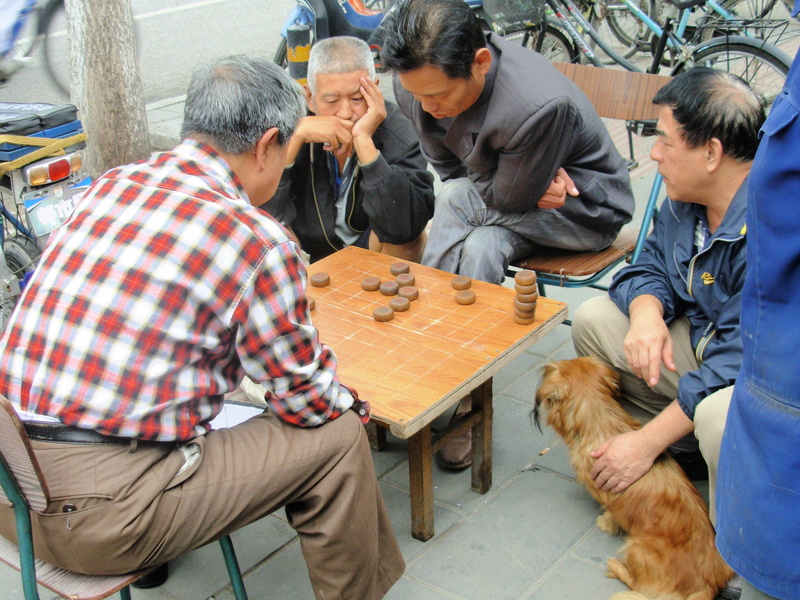 A sidewalk game of – Chinese checkers? CHAPTER TWO, in which I learn how far away China is from home. China wasn’t a bad place for the privileged foreign white-collar workers recruited to its businesses. At China Daily, dozens of English-speaking foreigners worked alongside Chinese employees as editors, writers, video producers and graphics designers. We hailed from the United States, Britain, Canada, India, Australia, Scotland and New Zealand. Between the free rent, the inexpensive food and the cheap, efficient subway system, it was possible to live on $500 a month in Beijing, a megalopolis of some 20 million people. I even enjoyed the huge comfort of having one of my oldest friends working at the same place and living just two floors below me. Without Renee, I never would have made it to the end of my contract. The trip on the plane had hinted at what was to come, but after 20 hours of travel, I was too numb to realize it. While on the plane I couldn’t help but notice, crammed close as we were, that Chinese seatmates all around me were busily picking their noses. For some reason, it didn’t occur to me that this would be a common sight for the next 12 months. In the United States, airplane passengers scatter as soon as they deplane, eagerly re-establishing the ample boundaries of their personal space as they walk through the terminal. In China, my fellow passengers seemed completely unfazed by remaining jammed together in a massive crowd that carried each of us along in baby steps, hobbled by the jumble of bodies jostling up against one another. Even with room to spread out, they seemed to prefer remaining clumped together in the shape of the giant tube we’d been squeezed into for 13 hours. At 5’ 11” tall, I stood head and shoulders above the masses, looking down on bobbing black heads as we moved en masse past attendants who waved temperature-taking devices at us to screen out those who might have the latest version of flu, then on and off trams to the terminal and through customs. Imagine landing in an alien place where you don’t speak, read or write the language, and almost nobody there knows yours. In effect, you become illiterate, deaf and mute. The simplest tasks of daily life turn into problems, reducing you to dependency on strangers who can’t understand you. Making a phone call, buying food, finding your way around: All become challenges at which you are suddenly incompetent. It brings out unattractive aspects of one’s personality. Those hurdles are overcome, but the enormous gulf of cultural differences remains. If you’ve only spent a couple of weeks vacationing in another country, you can’t know how hugely we’re affected by culture. We assume we know how people feel and think because we’ve been surrounded all our lives by people who feel and think much as we do. We mistake these shared assumptions for human nature. Much of what we think we know about people turns out to be completely wrong when we’re plopped into a radically different society. Even graphics, like those meant as operating instructions on appliances or directions in the subway, will turn out to mean something other than what they seem so obviously – to you – to communicate. In China, for example, “yes” isn’t always an affirmative answer, just a way of not saying “no,” which they fear might be thought rude or cause them a loss of face. They avoid directness, considering it too confrontational. To outspoken, blunt Westerners, the Chinese notion of tact or politeness often looks like dishonesty or evasion. This is not to say that foreigners are treated badly or aren’t able to get to know individual Chinese. But the vast cultural gulf between East and West can hinder the ability to make genuine friends. In addition, Americans carry a special burden, a volatile Chinese attitude comprising suspicion, competition, curiosity and hostility that goes back generations. Chinese the same age as Baby Boomers like me spent their gym classes lobbing fake grenades at imaginary invading American soldiers, or practiced thrusting pretend bayonets into them. Presumably, Chinese youth aren’t still being warned about an imminent (and equally imaginary) invasion by the United States. Even so, a young Chinese co-worker told me they assumed all Americans working there were spies. After weeks of constant confusion, strange food and opaque customs, Westerners typically are walloped by culture shock, a miserable mix of stress and homesickness. Mine was aggravated by close attention to news reports from within China, a daily chronicle of extreme oppression, corruption and cover-ups. Not even the active repression of government censors could hide the ugly, brutal, unjust and often fatal conditions of daily life for the average Chinese. The day after the first snowfall of the year in Beijing, authorities quickly took credit for it. Big, wet flakes blanketed the city on Nov. 1, a month earlier than normal. The next day, the city’s Weather Modification Office proudly announced it had seeded the skies over the city the previous night with doses of silver iodide. They wanted to break a 100-day drought. But because they hadn’t been sure it would work, they kept quiet about it until after the fact. There was no mention of snow in the weather forecast. Tons of it fell. It stranded thousands of people at the airport, many of them trapped for hours on motionless planes, after hundreds of flights had been cancelled. (The inept handling of all those frustrated passengers is another story.) The power grid faltered, with 60 blackouts around the city as heavy snow collapsed tree branches and electrical wires. Public anger exploded after the weather-mod people finally spoke up. But they offered only a half-hearted acknowledgement couched in dense bureaucratese. “It shows there is a lot of room to improve the national weather manipulation warning system for the public,” a press officer said. A 19-year-old taxi driver in Shanghai cut off a finger to protest his arrest by traffic cops. He said police had entrapped him in a sting operation against unlicensed cabs, and that he was innocent. Eventually, police admitted he was correct and that yes, they had been paying people bounties for every illegal cab they could help police nab. The cabby said cutting off a finger was the only way he thought his plight would be taken seriously. Thirty migrant workers climbed onto a downtown bridge in Guangzhou on Nov. 2 and threatened to commit suicide after their employer failed to pay them. By May of this year, 15 people had already climbed the same bridge and threatened to kill themselves for various reasons. Also in Guangzhou, one hundred relatives of a woman whose baby died in a hospital on Nov. 3 went on a rampage. They smashed equipment and windows until police sealed them off on one floor. Finally, a brawl started in – where else? – Guangzhou last weekend after two children bumped into each other. Their angry mothers first fought each other, then called relatives and friends to come help. Police arrested 26 people after eight police cars were destroyed and three officers injured. The central Chinese government has ordered that free swine flu vaccinations be given to anybody who wants one, but local authorities have been charging for them. Local governments are supposed to fund the free shots, but poor areas have a hard time affording them. In some parts of the country, authorities have charged an “equipment fee” of 5 yuan (73 cents) per shot. The mainland so far has had almost 51,500 cases of A/H1N1, including eight deaths. In central China’s Henan province, 300 villagers discovered that local authorities had removed their names from census lists as long as 13 years ago by declaring them dead. This allowed local government to hold back tax payments owed to higher levels, but it also deprived the “dead” of accumulated medical and pension benefits for all those years. In central China’s Hubei province, up to 6,000 farmers have been selling their blood twice a month for years to help cover their basic expenses. They get 168 yuan ($25) each time. The average annual income of rural Chinese residents is about $572. Despite the nearby presence of Renee and a community of English-speaking expats all around me, I hit the culture-shock wall after six weeks, when just reading that day’s China Daily left me sobbing in despair over breakfast. At this point, some expats never regain their emotional equilibrium or sense of humor. The majority of Westerners don’t last a year in China. Those who do often rely on drink or drugs to get through their days, and that was true among the foreigners at China Daily. 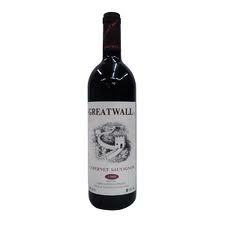 My friend and I relied on bottles of cheap Great Wall wine purchased at the 7-11 across the street, which we downed while watching bootleg American teen-slasher movies. We clung to our English-speaking friends while tentatively getting to know a few of our Chinese co-workers. I never learned any Mandarin beyond the words for “hello,” “beer” and “thank you.” As an English-speaking foreigner who spent only one year in Beijing, I don’t know much about China. But even that brief time skimming the surface of their society gave me a bit of insight into the world’s most populous country. This entry was posted in Commie wage slave, Uncategorized and tagged 7-11, Beijing, China, China Daily, expats Chinese culture, Great Wall, Great Wall wine, Westerners. Bookmark the permalink. I am trying to comment but some Chinese genie must have slipped into my computer as my comment area keeps disappearing. Anyway – that was certainly all the bad news that was fit to print – but I expect more will be forthcoming? I hope so – I hate to stop reading in the middle of any story – especially a mystery such as China itself. Keep on recalling what that journey was like and enlighten us. Why are we all so uninformed here of their everyday existence woes?